If the eurozone breaks apart - and it seems we're back to worrying about that yet again - I don't think it will be because the Greeks are being unreasonable (or uncool). Mr Varoufakis is braced for an arid meeting on Thursday with his German counterpart and long-time nemesis Wolfgang Schäuble, a man he once accused – borrowing from Tacitus - of reducing Europe to a desert and calling it peace. “I will try to be as charming as I can in Berlin. I will tell Mr Schäuble that we may be a Left-wing riff-raff but he can count on our Syriza movement to clear away Greece’s cartels and oligarchies, and push through the deep reforms of the Greek state that governments before us refused to do,” he said. “But I will also tell him that we are going to end the debt-deflation spiral and do what should have been done five years ago. That is not negotiable. We have a democratic mandate to challenge the whole philosophy of austerity,” he said. [A]t this point Greek debt, measured as a stock, is not a very meaningful number. After all, the great bulk of the debt is now officially held, the interest rate bears little relationship to market prices, and the interest payments come in part out of funds lent by the creditors. In a sense the debt is an accounting fiction; it’s whatever the governments trying to dictate terms to Greece decide to say it is. OK, I know it’s not quite that simple — debt as a number has political and psychological importance. But I think it helps clear things up to put all of that aside for a bit and focus on the aspect of the situation that isn’t a matter of definitions: Greece’s primary surplus, the difference between what it takes in via taxes and what it spends on things other than interest. This surplus — which is a flow, not a stock — represents the amount Greece is actually paying, in the form of real resources, to its creditors, as opposed to borrowing funds to pay interest. Greece has been running a primary surplus since 2013, and according to its agreements with the troika it’s supposed to run a surplus of 4.5 percent of GDP for many years to come. What would it mean to relax that target? It would not mean demanding that creditors throw good money after bad; everyone has already implicitly acknowledged that the debt will never be fully paid at market rates, but Greece is making a transfer to its creditors by running a primary surplus, and we’re just arguing now about how big that transfer will be. When companies go bankrupt, a debt-equity swap is a fair and efficient solution. The analogous approach for Greece is to convert its current bonds into GDP-linked bonds. If Greece does well, its creditors will receive more of their money; if it does not, they will get less. Both sides would then have a powerful incentive to pursue pro-growth policies. This short paper by Marcel Fratzscher, Christoph Steffen and Malte Rieth of DIW Berlin lays out how GDP-linked debt might work. The proposals offer a bond swap to ease the debt burden – 177pc of GDP - without demanding an explicit writedown of Greece’s foreign loans. This allows both sides to save face. The aim is to slash Greece’s primary budget surplus from the troika target of 4.5pc of GDP to around 1.5pc to pay for welfare pledges and boost investment. “This gives us a reasonable buffer. The old target is ludicrous,” Mr Varoufakis said. Loans from the EU bailout machinery would be replaced by GDP-linked bonds, akin to Keynes’s "Bisque Bonds" in the 1930s. Money owed to the ECB would convert into “perpetual bonds”. The euro had been enshrined in a treaty but not yet come to life in the autumn of 1997, when Martin Feldstein, the influential president of the National Bureau of Economic Research, published an essay arguing that European leaders’ hopes that a monetary union would foster greater harmony and peace in a Continent repeatedly ravaged by wars were misplaced. It “would be more likely to lead to increased conflicts,” wrote Mr. Feldstein, a former chief economic adviser to President Ronald Reagan. Fixing this is not impossible. The most direct way would be for the creditors in Europe’s north to relax the tight conditions on debtor countries, provide them with debt relief and allow them to spend more to kick-start growth. Alternatively, they might just invest more themselves, which would lead to higher wages and prices at home, encouraging more output in their poorer neighbors. This path presents some political complications, however. Voters in Germany and other rich northern countries have no appetite for transfering resources to the vulnerable neighbors around Europe’s edge. And, comfortably insulated by their own prosperity and conditioned by memories of hyperinflation after World War I, they still fear higher inflation. Even the direst warnings of impending doom seem unlikely to shift the public mood. As we've seen in the US, the right policies to deal with financial crises and depressions do not appeal to most people's moral intuition, and are thus very difficult politically. If the euro - and the project of European unity - is to be saved, it will take some courage on the part of the leaders in Germany and other "northern" countries. Update: the embedded video was taken down, but a shorter version is available at the link. while the share of female PhD is now up to about one-third, the fraction of undergraduate economics majors has slipped back under 30%. One of my ongoing, and largely futile, battles as a college professor is to convince my students that their grades don't matter - or at least, they don't matter nearly as much as the students often think they do. Alas, obsession with grades is pretty deeply entrenched in young people who've been coached for years to compete to get into college. This may have gotten worse over time with perceived increases in the competitiveness of admissions (the perception isn't fully accurate: declining acceptance rates are partly due to colleges soliciting more applications to make their numbers look better, as well as the growing ease of applying to large numbers of colleges), as well as increasing anxiety about financial outcomes after college. Not only does the obsession with grades distract us from the real purpose of learning, the apparent difference between how men and women respond to them contributes a gender gap in fields like economics, which appear less prone to grade inflation (this study from Wellesley provides further evidence on how grade inflation distorts students' choices, though it doesn't consider gender differences). One could make the case that grade inflation is thus an equity issue. 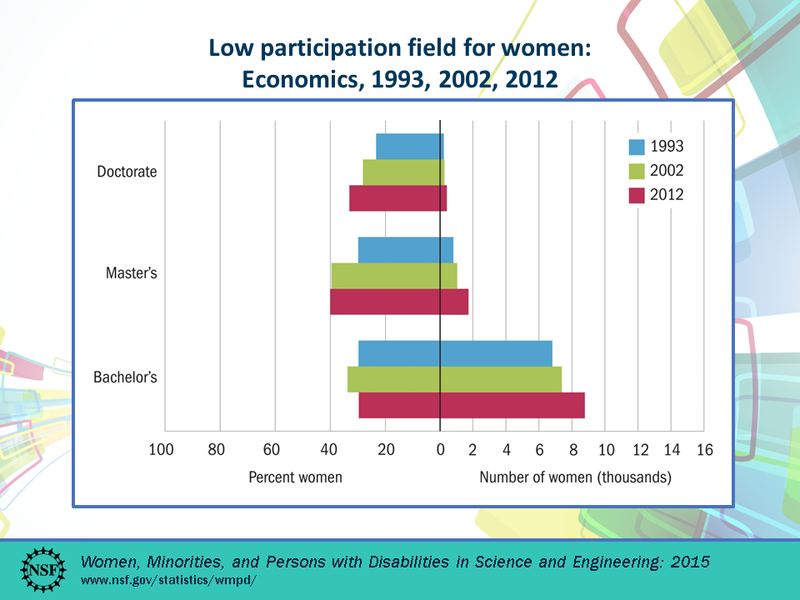 The better news from the NSF's report is the continued increase in the share of women earning PhDs (though the discipline still faces "leaky pipeline" issues). I'm not too worried that the decrease in the share of women earning US undergraduate economics degrees will impact graduate education, since US graduate programs draw from a global pool (only about 30% of US PhDs go to Americans). However, I don't think we should be hopeful that a greater share of female professors will bring more women into undergraduate economics: while a "role model" effect sounds plausible, the empirical evidence does not seem to support it.